As the state’s largest higher education system, the SC Technical System serves more than a quarter million South Carolinians each year and educates more of our state’s undergraduates than all the other public higher education institutions combined. Dedicated to making a quality higher education both accessible and affordable, the System plays a key role in educating and training South Carolina’s workforce for the in-demand, high-skilled jobs of today and tomorrow. In addition, the System’s internationally-recognized statewide programs – readySC and Apprenticeship Carolina – work to attract new companies to the state as well as provide comprehensive workforce solutions to ensure they stay and grow here. By making a quality higher education accessible, affordable and relevant to the people of South Carolina, the SC Technical College System is preparing our state’s workforce for the jobs of today and the careers of tomorrow. 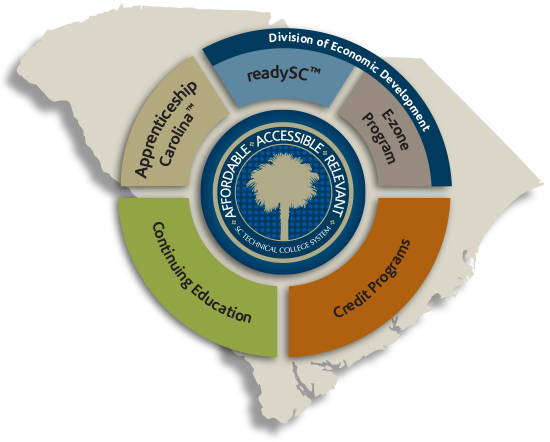 The SC Technical College System will lead the nation in delivering relevant and effective programs that advance workforce development, promote economic development and ensure attainment of student learning goals. 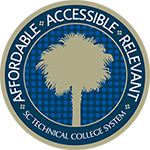 The SC Technical College System provides learning opportunities that promote the economic and human resource development of the state.